Whether you’ve been feeding your Christmas cake for several months or you baked it just a few days ago, you’ve probably got an idea in mind of what the finished cake will look like. Most celebration cakes have a base which begins like this, and from here you can go wherever your imagination will take you! I know many people are averse to marzipan (for reasons completely unfathomable to me! 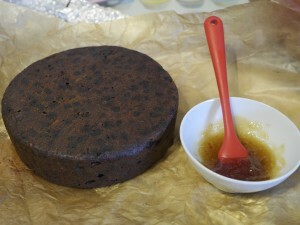 ), but fruit cakes should always have a layer of marzipan between the cake and the icing. This is for two reasons. Firstly, a marzipan layer, allowed to dry for a couple of days, will seal the cake properly before applying the roll out icing (sugarpaste). 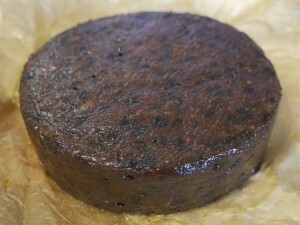 Fruit cakes are often stored for long periods of time (not to mention displayed throughout Christmas) and moisture from the cake would otherwise eventually seep through the icing and discolour it. (If you’re icing the cake and serving it within a couple of days, you could probably get away without the marzipan). Secondly, a marzipan layer helps to provide a smooth base before the icing goes on and helps to give a professional finish. You don’t want bumpy icing now, do you? Incidentally, for the ‘smoothness’ aspect alone, I would always use marzipan beneath sugarpaste when making a non-fruit celebration cake, too – unless otherwise instructed. If you’ve found this guide useful, please do let me know in the comments below! The instructions below are for an 8″ round cake. The cake in the pictures is my Cherry Brandy Christmas Cake. A thick cake board. I always use a 10″ diameter for an 8″ cake, as it makes carrying the cake a bit easier! 900g sugarpaste (roll-out or fondant icing) in your choice of colour. This amount will cover the cake and the surrounding cake board for a professional finish. *Not essential, but inexpensive and very helpful to have. 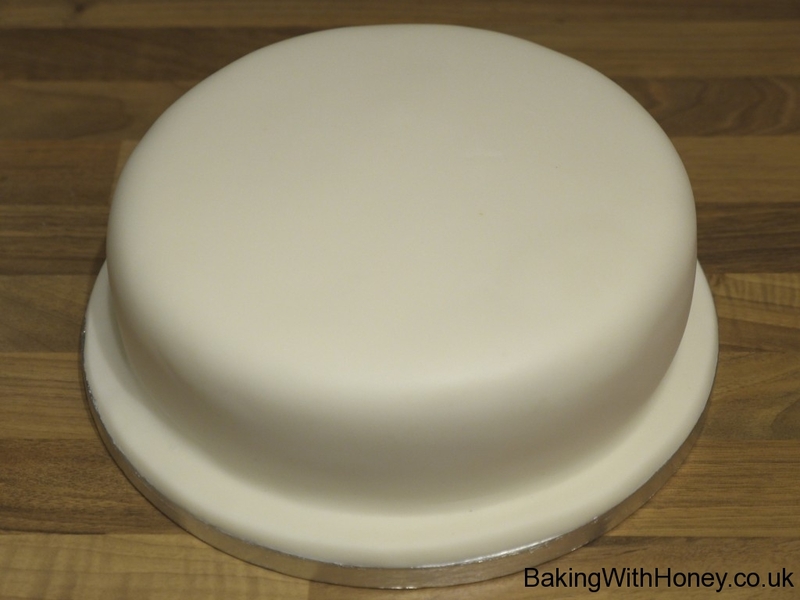 If the original ‘top’ surface of your cake is quite bumpy, carefully turn it over it over so that the bottom is facing upwards. You now have a smooth surface to work on! Warm the jam for a few seconds in the microwave until it is runny enough to spread evenly, but not too thickly, over the top and sides of the cake. 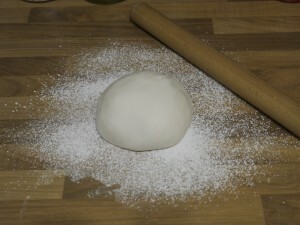 Lightly knead the marzipan and place on a surface dusted with plenty icing sugar. (Do not use flour or cornflour). Roll out something resembling circle, with a thickness of about 0.5cm. Marzipan spacers are fantastic for rolling a totally even thickness. 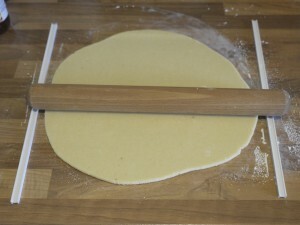 Rotate the marzipan after every few rolls – this will prevent it from sticking to the surface. I find it helpful to place the cake on its board at this point. 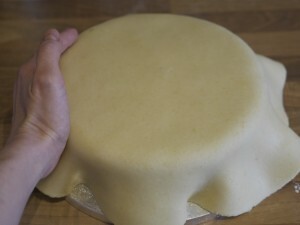 Gently slide your hands under the marzipan and lift it on the the cake. 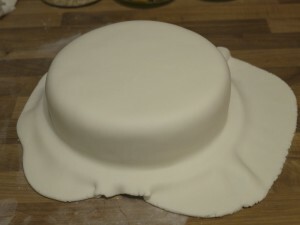 Use the palms of your hands to smooth the top of the cake first, then mould the marzipan to the upper edges, working your way down the sides very slowly. 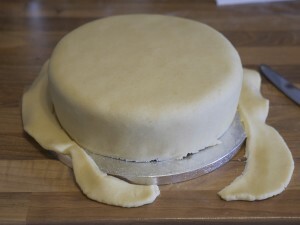 Marzipan is quite malleable, so just keep going until the cake is covered. 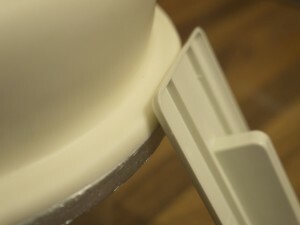 Aim for smoothness, but it doesn’t have to be perfect – remember the icing will cover any small imperfections. 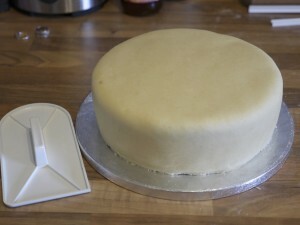 Trim off the excess marzipan and give it a final polish with an icing smoother, if you have one. It is now best to leave the marzipan to ‘dry out’ for a couple of days. I place mine in a cardboard box so that the air can circulate, but the cake is still protected from dust etc. Do not put it in an airtight container. You will know when the marzipan has dried out – it will actually feel drier to the touch, almost as though the lightest crust has formed. Around 48hrs should do it. If you are eating the cake within a week or so, you can skip the drying out part if you need to. When the marzipan has dried out, lightly knead the sugarpaste and roll out (to a 0.5cm thickness) on a surface dusted with icing sugar. 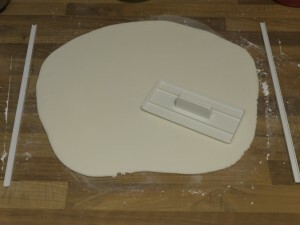 Once you’ve finished rolling, it is helpful to give it a quick polish with the icing smoother. Brush a little (cooled) boiled water over the marzipan and also the exposed board. (If you don’t want to ice the board, then obviously don’t wet it!) This is to make the sugarpaste stick. Lift and drape the sugarpaste over the cake, following the same process as the marzipan. It is helpful to remove any rings etc that might catch on the icing. 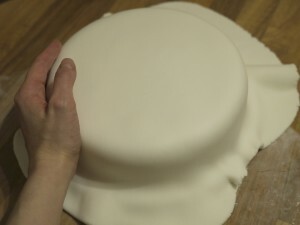 Use the palms of your hands again to mould the sugarpaste to the cake and board (if desired). Small, quick movements is best for gently easing the paste into place. Be extra careful to avoid catching your fingernails on the icing! 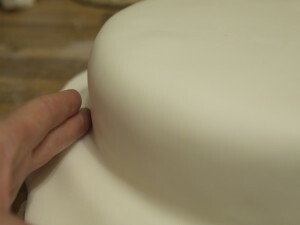 When the cake is evenly covered, very gently press a finger along the bottom edge of the cake, to get a clean definition between the cake and the board. Don’t forget to lightly press the icing to the board, too. If you’re not icing the board, just use a knife to carefully remove the excess paste. When you are happy with the icing, use a polisher (or the palms of your hands) to bring out a natural sheen on the icing. Use a light, swift touch! Now, if you are icing the board, you will need to remove the excess paste. Angle a polisher as shown, gently but firmly pressing downwards several times on the overlapping icing at the edge of the board, until it starts to come away. As it comes away, run the angled polisher along the edge to continue the process until all the excess paste is removed. You can run the polisher around the edges to smooth any rough looking bits until you are happy with it. Use a dampened piece of kitchen towel to tidy up and remove any remaining bits of sugarpaste from the edge of the board. This is particularly essential if you’re planning to wrap a ribbon around it. Applying ribbon: Stick double sided tape all around the edge of the board. Remove the backing tape. 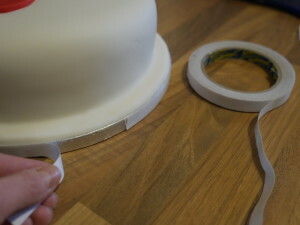 Then, starting at the back of the cake, firmly press the ribbon to the sticky tape. 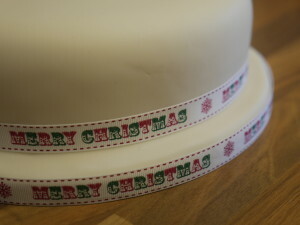 The ‘join’ should be at the back of the cake, and you can cut another little strip of tape to stick down the overlapping ribbon. In addition, you can also wrap ribbon around the bottom of the cake if you like – obviously do not actually stick it to the cake! Wrap the ribbon neatly to the cake and just use a little piece of tape on the join instead to hold it in place. Best instructions I found. Thank you! First time trying my hand at decorating a birthday cake for my Dad. This is a very helpful guide, thank you. Thank you Deb and everyone else for your lovely comments. I’m so glad you found the guide helpful and I really appreciate the feedback! Hi Tanya, it depends what type of cake it is. If it’s a fruit cake (fed with alcohol and marzipanned first), in my experience it would last for several months once iced. If it’s a sponge cake (Victoria or chocolate for example) I wouldn’t make it more than about 4-5 days in advance. Once iced, I would store it in a cardboard cake box (from any cake decorating shop) rather than an airtight container as sometimes the icing can sweat a bit if it’s kept totally airtight for more than a day or two. Hope this helps! Hi Carol, some people prefer to roll out and cut a long strip of marzipan to wrap around the sides (or even 4 individual strips for each side – you get a very boxy looking square this way) then do a square piece to place on the top. I just use the same method as a round cake, but you do have to be a bit more careful because of the corners. 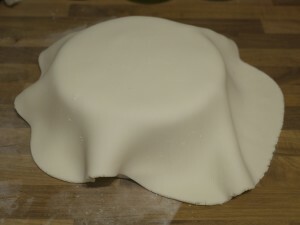 Drape the marzipan over the cake, and (starting at the top of the corners) use the palms of your hands to very gently and slowly mould the marzipan into position. The corners – top to bottom – are the most important parts. 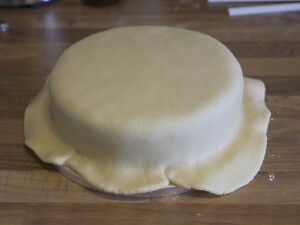 If you have an excess ‘fold’ of marzipan along a side, you can slice it and re-join, using a little water. Don’t worry too much about imperfections as you’ll be covering it with icing anyway. Use the marzipan layer as practice for the icing! Good luck and Merry Christmas! Just another thumbs up, thanks for writing this! 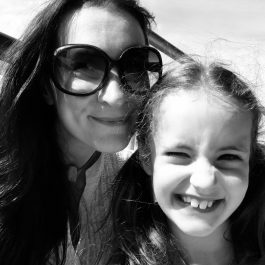 Katy , I have made a 12″ fruit cake and a 10″ sponge cake for a Christening in 6 weeks time. I have frozen the sponge cake. I’d like to know when I should marzipan the fruit cake and ice it with roll out icing. Also should I marzipan the sponge cake before applying fondant icing. Can you advise please. Hi Jacqui, regarding the fruit cake, it depends on whether you are feeding it. I tend to feed mine on a weekly (sometime fortnightly if I forget!) basis, until around two weeks before it will be eaten. 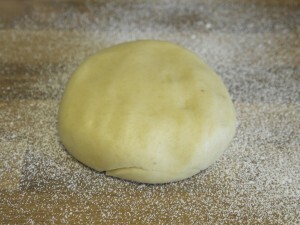 I would then apply marzipan and allow it to dry out for several days before putting on the icing. Assuming the cake contains alcohol, once it is ‘sealed’ with marzipan and icing it will keep for months. If you’re not feeding the cake, I would be inclined to marzipan and ice it immediately as it will be far more likely to dry out without the extra moisture provided by the alcohol. (And if the cake doesn’t contain any alcohol at all, I’m afraid I’m not sure how long it will keep as I don’t have experience of storing non-alcoholic fruit cakes). 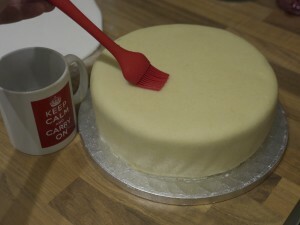 Regarding the sponge cake, personally I would always prefer to apply marzipan before icing as ultimately it gives a much smoother finish. However lots of people can’t stand marzipan so it’s worth checking before using it! Hope this helps, good luck with the Christening cake! Hi Jacqui, I’m in the process of doing the exact same thing. I’ve made my fruit cake and have almond iced it. Will cover in homemade fondant icing soon. I have a choc mud cake ganached in the freezer. Just wondering when you took your cake out of the freezer and iced it? Mine is for my Grandaughters Christening. Hope all went well for you! Thank you John, I’m glad you found it useful! I am going to ice some buns with glace icing for a party and put some heart sprinkles on top. How far in advance can I do this please? Also should I keep them in an airtight container when done or not? Many thanks. Hi, I wondered if you could advise me on my Christmas cake, I baked my cake on the 14th October and it has had 3 generous feedings with Brandy. I don’t really want a cake so alcoholic you should avoid driving afterwards so I wanted to find out if I could marzipan it this weekend (4th November) Then put the fondant icing on and decorate the cake on the 1st weekend in December? I have read that fondant icing should only be used up to a week in advance or it goes strange. Are you able to confirm this for me. Hi Vicki, sorry I missed this! As long as you let the marzipan dry out for a few days after putting it on the cake, you can apply the sugarpaste/fondant well in advance. Nothing strange will happen, as long as you keep the cake in a container. If you leave it uncovered for prolonged periods the sugarpaste just go a bit hard that’s all. Hope this helps. Hi there, I used honey instead of apricot jam and I’m worried it’ll come off with the icing when I cut into the cake. I haven’t iced the cake yet, I put on the marzipan last night. Should I take it off and start again with apricot jam or do you think it’ll be ok?